One of the truly unique experiences (and there were many) of this year's TCM Classic Film Festival was the joy of viewing a nitrate print of The Archers' (Michael Powell and Emeric Pressburger) great masterpiece Black Narcissus (1947) on the big screen at Hollywood's Egyptian Theatre. Black Narcissus is a breathtaking film, one of the most spectacular examples of mid-century Technicolor films ever produced. I could hardly imagine that its often voluptuous, frequently Vermeer-like imagery could possibly look any better than I had previously seen. Little did I know that I would be transported to a realm of color that could be called other-worldly. The adjective "awesome" has been entirely worn out for decades, and so I'll simply say that the impact of seeing the film's lush Technicolor photography on nitrate-based film stock was awe-inspiring. Black Narcissus, the story of a group of nuns who are sent high into the Himalayas to open a convent school but are undone by the alien and seductive atmosphere, was filmed by master cinematographer Jack Cardiff. Cardiff would win the 1947 Oscar for color cinematography for his efforts and go on to film The Archers' next great masterpiece, The Red Shoes (1948). He would later take on Hitchcock's Under Capricorn (1949), Huston's The African Queen (1951), Albert Lewin's Pandora and the Flying Dutchman (1951), Mankiewicz's The Barefoot Contessa (1954) and Laurence Olivier's The Prince and the Showgirl (1957), among many other films. Color films printed on nitrate-based stock seem "illuminated" onscreen. Colors appear richer and more saturated and seem to almost shimmer. Nitrate, then, was the ideal medium for an artist of Jack Cardiff's standing as one of the finest, most influential color cinematographers in the world. Cardiff began his career in movies as a child actor but had moved behind the camera by the time color began to evolve. He became a Technicolor consultant in 1937 and was camera operator on Britain's first three-strip Technicolor film the same year. He developed a thorough knowledge and understanding of Technicolor while working for the company, and became a total expert on the process. As a director of photography and cinematographer, he became much in demand. When he was hired on The Prince and the Showgirl, Marilyn Monroe, whose production company produced the film, announced, "He's the best cameraman in the world, and I've got him!" Years later, when Ava Gardner was preparing to meet with the head of Simon & Schuster who insisted on seeing her before agreeing to publish a book about her, she insisted that her friend Jack Cardiff first rearrange and adjust the lighting in her living room, where the meeting would take place, to better enhance her face, which had been affected by a stroke. Jack Cardiff lived until 2009 and age 94. His storied film career covered seven decades and included a foray into directing. His 1960 adaptation of D.H. Lawrence's Sons and Lovers received seven Oscar nominations, including a Best Director nod. But it is the two classics he filmed back-to-back for Powell and Pressburger in 1947 and 1948, Black Narcissus and The Red Shoes, that endure as his great masterworks. The following segment, part of a 2010 feature documentary about his life, offers a glimpse into the making of Black Narcissus and Cardiff's role in its production. 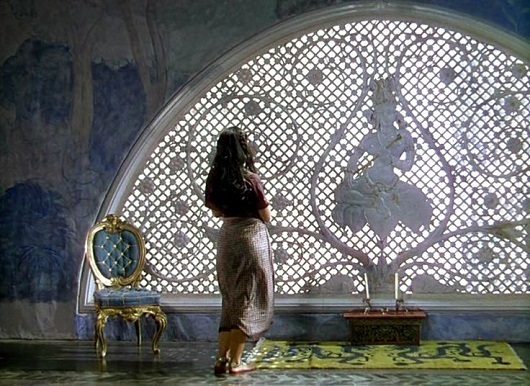 Black Narcissus won 1947 Academy Awards for Best Color Cinematography (Jack Cardiff) and Best Color Art Direction-Set Decoration (Alfred Junge). In 2001, Jack Cardiff received an honorary Oscar for his contribution to film as "a master of light and color." This was the first honorary Oscar ever given to a cinematographer. "Black Narcissus" is fantastic, a work of art - sounds like you got to see it in its optimum, in-depth form. I'm not sure how often I've viewed an original nitrate print, they're very flammable and they decompose over time. This movie is such a great example of visual storytelling - one of the greatest - same goes for "The Red Shoes". This was probably the one screening at the festival that I absolutely could not miss. And I feel honored to have been able to watch a nitrate print of this masterpiece. I'm hoping The Red Shoes exists on nitrate, or soon will. What an AMAZING experience that would have been to see this film on nitrate in that gorgeous theatre. I hope you DO have a chance to see Black Narcissus on nitrate but it is a beautiful film to see, no matter what the process. It is too bad they do not offer a demonstration of the difference between a nitrate print and safety film by showing a trailer or brief clip before the feature. A friend said she doesn’t buy into “The myth of nitrate” and it might be sacrilege to say that I often understand her assessment until I see a stunning black and white print like THE MAN WHO KNEW TOO MUCH. Martin Scorsese’s introduction was perfect as he balanced his personal stories with technical info about nitrate. I am sure LAURA would have been the same and I am sorry I missed it. Would the average moviegoer know the difference? I doubt it. And do I get in trouble by agreeing with another friend who said he preferred the digital restoration of BLACK NARCISSUS? I love Powell-Pressburger films but both this and LADY IN THE DARK had muted colors and soft focus, not showing off the gorgeous visuals each film offers. I mentioned this to Chris Horak of the UCLA Film Archive who provided the print of LADY and he explained that these prints are 70 years old and even though the three-strip Technicolor does not fade, the actual prints have turned yellow and that inhibits the full explosion of color you expect from a Tech print. 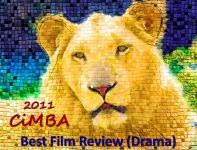 I know others raved about them but I was not alone in my reaction. 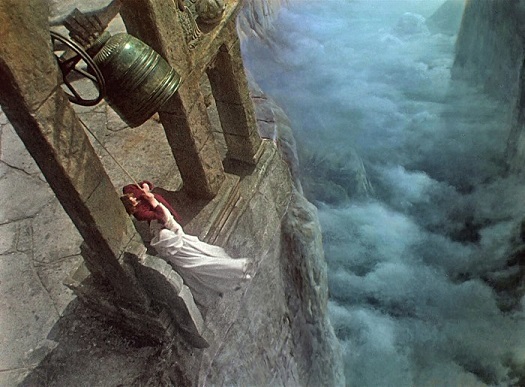 I have seen BLACK NARCISSUS, A MATTER OF LIFE AND DEATH, THE RED SHOES and THE THIEF OF BAGDAD on nitrate many years ago and my memory of those showings is what I had hoped to see at the Egyptian. And I am glad I got another chance but it just wasn't the same. Our experience of Black Narcissus at the Egyptian on April 7 was obviously different. I've seen the film many times, but this was the first time on the big screen and, I believe, the first time I've seen a nitrate print. I thought it very special, personally. Thanks for stopping by and commenting, Gary. I'm jealous, of course! 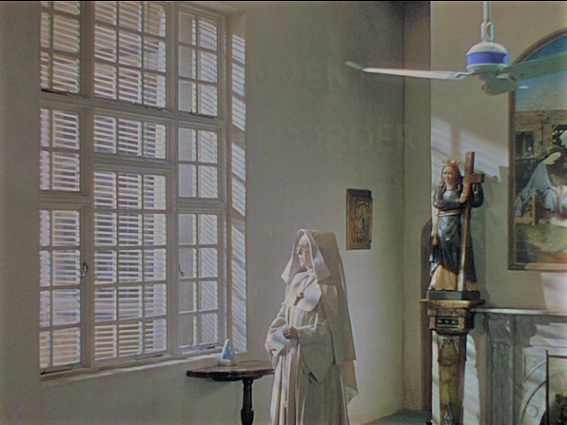 BLACK NARCISSUS may top my list of films where color was used as an enhancement. The richness and gradients are spellbinding, but it's the use of them that always amazes me (e.g., the impact of the red lipstick). It's all the more impressive considering that most of the film was shot inside a studio. I agree, Rick. The richness and use of color on Black Narcissus is just stunning. It's beautifully filmed and the story itself is fascinating - and unusual. An amazing film all around. This is a fine, interesting article. I enjoyed reading it, and I look forward to reading more of your articles in the future. Was "Black Narcissus" a British film? Hello, Tiffany, and thank you! Yes, "Black Narcissus" is a British film (as is "The Red Shoes"), a production of 'The Archers' (Michael Powell & Emeric Pressburger). And thank you for including a link to info on your blogathon, I'll check it out. Thank you for the information. I look forward to hearing from you soon!